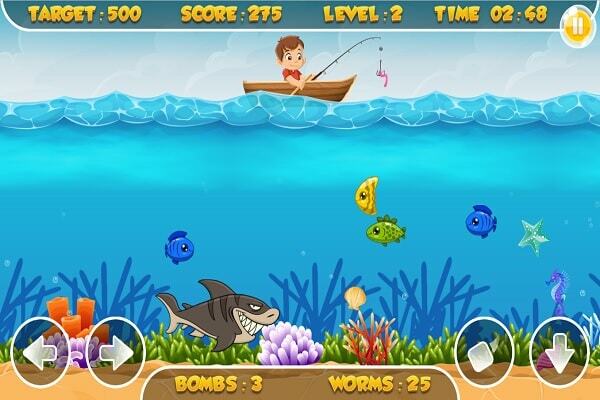 Description: Fishing Frenzy is a fishing sports game. Given limited time and worms, try to catch as many fish as you can. Move your boat left and right to find the perfect fishing spot to drop your line. In this game, you use a worm every time you catch a fish so look at your worm count and make sure you’re catching the fish with the most points. Also, you’re given bombs to wipe out an entire area of fishes. Use these bombs to earn a lot of points when there are a lot of fishes on screen. Sharks will give you 50 points, but they will also eat the fish you catch if it’s in their way. Watch out and avoid the sharks with your catch. Power ups will be floating up in bubbles. To obtain the power ups, move your boat on top of the bubbles. You will receive an extra 30 seconds for each clock bubble, you will receive 10 worms for each worm bubble and you will receive 1 bomb for each bomb bubble you obtain. The power ups will help you in each level. There are many levels in this game. Each level has a require score and you will advance if you reach or surpass score. Controls: On a PC, use your arrow keys to move the boat then press down to drop your fishing line. Press space bar to drop a bomb to clear all the fish in the area. On a mobile device? Then use the corresponding buttons on screen to play.